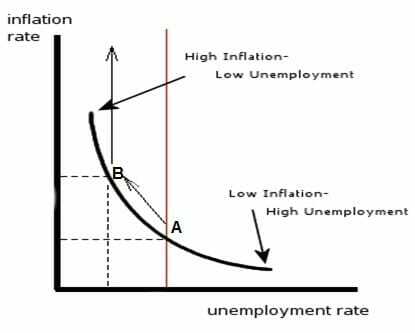 The Phillips Curve is the graphical representation of the short-term relationship between unemployment and inflationFiscal PolicyFiscal Policy refers to the budgetary policy of the government, which involves the government manipulating its level of spending and tax rates within the economy. The government uses these two tools to monitor and influence the economy. It is the sister strategy to monetary policy. within an economy. According to the Phillips Curve, there exists a negative relationship between the unemployment rateEconomicsCFI's Economics Articles are designed as self-study guides to learn economics at your own pace. Browse hundreds of articles on economics and the most important concepts such as the business cycle, GDP formula, consumer surplus, economies of scale, economic value added, supply and demand, equilibrium, and more and the inflation rate in an economy. In 1958, Alban William Housego Phillips, a New-Zealand born British economist, published an article titled “The Relationship between Unemployment and the Rate of Change of Money Wages in the United Kingdom, 1861-1957” in the British Academic Journal, Economica. In the article, A.W. 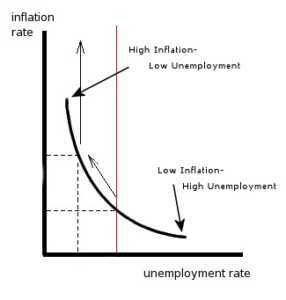 Phillips showed a negative correlation between the rate of unemployment and the rate of inflation – the years with high unemployment showed low inflation and the years with low unemployment experienced high inflation. After the publication of the General Theory by John Maynard Keynes, most economists and policymakers believed that in order for the economy to grow, aggregate demand must be increased in the market. However, if policymakers stimulated aggregate demand using monetary and fiscal policy, the rise in employment and output was accompanied by a rapidly increasing price level. If policymakers then wanted to reduce inflation, then they would need to reduce output and employment in the short run. In “Analytics of Anti-Inflation Policy,” Samuelson and Solow pointed out that Phillips Curve could be utilized as a menu by policymakers. 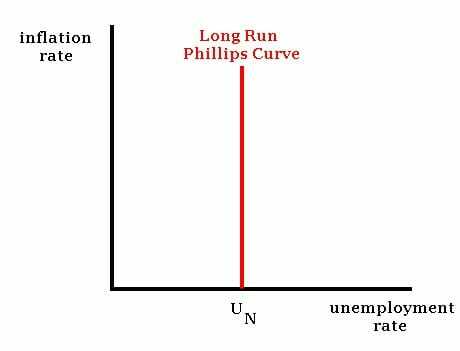 The Phillips Curve shows the various inflation rate-unemployment rate combinations that the economy can choose from. After policymakers choose a specific point on the Phillips Curve, they can use monetary and fiscal policy to get to that point. Point A represents a situation where the economy faces high unemployment but low inflation. Policymakers make the decision that the economy must prioritize output. Thus, the policymakers raise government spending and cut taxes to stimulate demand in the market. As a result of these policies, employment and output increase within the economy. In the short run, however, there is a limit to how much the output can be increased. After this limit is reached, any increase in demand in the market leads to inflation. Such a situation is represented by point B. At point B, the economy faces low unemployment but high inflation. In an ideal world, policymakers would like a situation where both unemployment and inflation are low. However, according to historical data studied by Phillips, Samuelson, and Solow, this is impossible. In 1968, the Nobel Prize-winning economist and the chief proponent of monetarism, Milton Freidman, published a paper titled “The Role of Monetary Policy.” In this paper, Freidman claimed that in the long run, monetary policy cannot lower unemployment by raising inflation. Freidman’s claim was heavily influenced by the classical macroeconomic theory that believed that the amount of money in an economy (money supply) was a nominal variable and could not influence a real variable such as employment or output. In 1970, another Nobel Prize-winning economist, Edmund Phelps, published an article called “Microeconomic Foundations of Employment and Inflation Theory,” which denied the existence of any long-term trade-off between inflation and unemployment. The Friedman-Phelps Phillips Curve is said to represent the long-term relationship between the inflation rate and the unemployment rate in an economy. The Freidman-Phelps Phillips Curve is vertical and settles at what is known as the natural rate of unemployment. The Natural Rate of Unemployment refers to the unemployment rate towards which the economy moves in the long term. The Natural Rate of Unemployment is a dynamic and positive concept. Thus, it changes with time. In addition, the Natural Rate of Unemployment may not be the socially optimal level of unemployment.